The seal that the publicity emblem (above) for the film Mohenjo Daro is actually based on (below) offers the opportunity to look at one of the most unresolved issues in ancient Indus studies: what was the so-called one-horned unicorn, and where did it come from? Drs. Parpola and Kenoyer have two different perspectives. 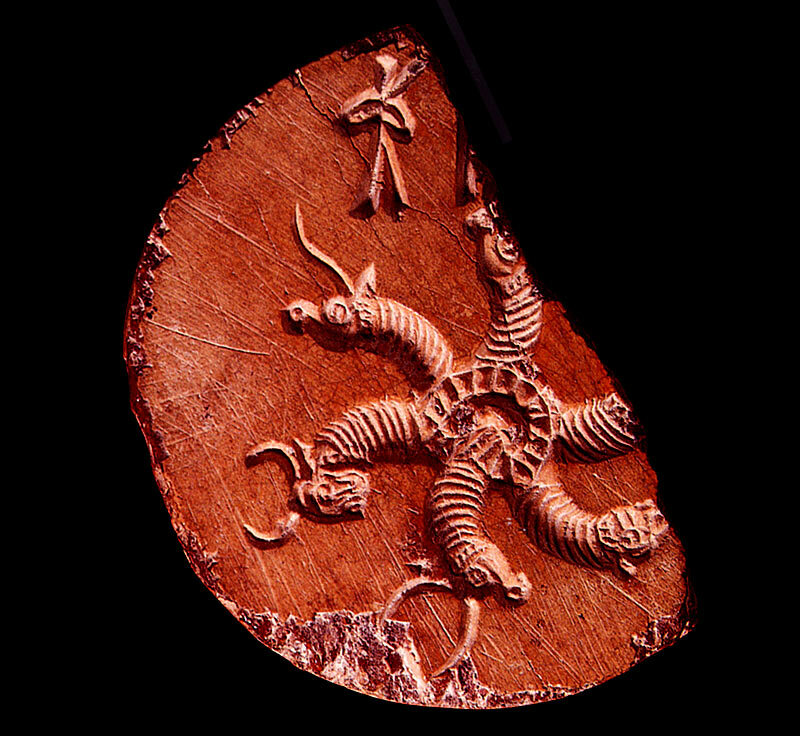 Asko Parpola writes "One broken round Indus seal from Mohenjodaro, M-417 (below), shows animal foreparts (protomes) arranged in a whorl. The animals preserved include the tiger, the Indian bison, the 'unicorn' bull, and the "'unicorn' with two zebu-like "horns". The occurrence of both one- and two- horned bulls does not prove, as has been claimed, that they are two different animal species. Though in Mesopotamian iconography the bull is also often depicted with a single horn, the artists there were not prevented from representing the bull with two horns as well; both variants are found in one and the same picture. Nor does the predominance of unicornity in the Indus Valley prove that the Harappans did not copy the motif from Western Asia; to the contrary, it may work the other way around, since the same emphasis on unicornity is found there as well. Considering the fact that the Harappans borrowed other art motifs from Mesopotamia, it seems more likely than not that they borrowed the motif of a single horn as well. The connection between the Ṛśyaśṛṅga legend and the Gilgamesh epic adds to this likelihood." The Harappan Unicorn in Eurasian and South Asian perspectives. in Linguistics, Archaeology and the Human Past, Indus Project, Research Institute for Humanity and Nature, Occasional Paper 12, Kyoto, Japan, 2011. Mark Kenoyer sees things very differently. In Iconography of the Indus Unicorn: Origins and Legacy he writes "After examining unicorn seals in detail and also examining most extant examples of terracotta unicorn figurines, I am convinced that the Indus seal carvers and clay modelers intentionally depicted a one-horned animal that should be considered the earliest example of the unicorn." (p. 113). He continues later in the essay: "The close affiliation with Indus ideology may have been one of the reasons why this motif disappeared with the decline of Indus urbanism, along with the Indus script, triangular terracotta cakes, cubical chert weights, and the tradition of burying the dead in coffins with pottery offerings. In an earlier publication, I proposed that although the unicorn disappeared in the Indus, unicorn seals carried to Mesopotamia by Indus merchants may have spread the idea of the unicorn to the Near East. From there it eventually reached the Mediterranean and was finally introduced into Europe (Kenoyer 1998). I am no longer sure if this is a valid explanation given the history of the unicorn motif as explained by Shephard (1978 ). It is possible that some aspects of Indus unicorn iconography contributed to later myths in West Asia, but this is a discussion to be more fully developed elsewhere." (Connections and Complexity New Approaches to the Archaeology of South Asia, Ed. by Shinu Anna Abraham, Praveena Gullapalli, Teresa P. Raczek, Uzma Z. Rizvi, Left Coast Press, Walnut Creek, California, 2013 p. 122). More on this issue, as well as the two papers by Drs. Parpola and Kenoyer cited above, will be published here soon.